The Guidant John Rose MN OVAL held their official lighting ceremony on Friday, November 10th, 2017 and remained lit through the season. The OVAL in Roseville is the largest outdoor skating facility in North America, with 110,000 square feet of refrigerated ice from November to March. 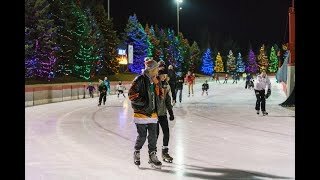 Enjoy skating, while taking in the sight of 120 trees with over 200,000 lights from Rainbow Holiday Design!